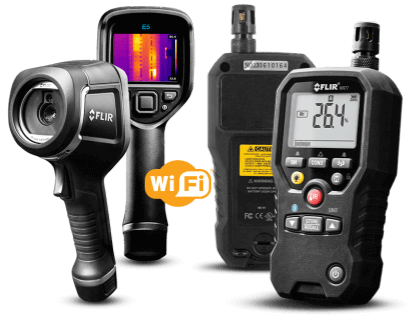 Learn more about the Flir E5 Infrared Camera with WiFi and MR77 5-in-1 Moisture Meter with Meterlink ®. Includes features and FAQs. The Flir E5 Infrared Camera with WiFi and MR77 5-in-1 Moisture Meter with Meterlink ® is a thermal imaging camera that also comes with a moisture meter. These two products can be used together to detect leaks and see thermal images. Pros: Rechargeable battery. Lifetime warranty on the moisture meter. Wi-Fi connectivity. Cons: Expensive package. No touchscreen. Bottomline: A great package for advanced moisture detection as the meter and the thermal camera can be used together for more accurate results. The Flir E5 Camera and MR77 Moisture Meter cost $1,898.99. How do I upload images from the Flir E5 camera to my smartphone. You can upload images to the Flir app using your wireless connection, and them access them via the Flir app on your smartphone. How long does the battery in the Flir E5 last? The rechargeable battery lasts for approximately four hours of continuous use. What is the Bluetooth range of the MR77 Pinless Moisture Psychrometer? The moisture meter has a maximum range for 32 feet or 10 meters. 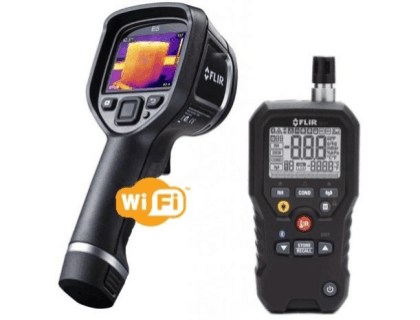 What are some Flir E5 Infrared Camera with WiFi alternatives?